Books have always been an integral part of my family history. 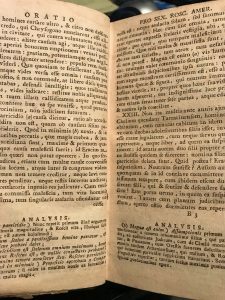 My grandfather had a library in his house in Italy with over 10,000 books. The oldest book I perused was printed in 1550. 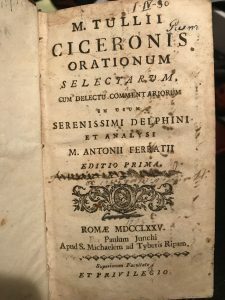 It was called Ciceronis Orationum. Unfortunately, this book, like most of the books in this collection, were lost to family politics. The only remaining books finding their way to Canada was a 1775 version of the same titled book, and a series of Jules Verne classics printed in the mid-to-late 1800s. In our family, books were more than a path to knowledge! They were period pieces that spoke to the culture and human spirit at a point in time. They were windows to the soul of the author. They were springboards to new ideas, innovations, and inspirations. They made us think, laugh, cry, escape, and even ponder alternate realities through fantasy and science fiction. Books took us places, and led us through journeys not possible anywhere else. In short, books stirred feeling in us that expanded our realm of possibilities, what could be more human than that? On a trip to Rome in 2008, I fondly remember performing several very clumsy pirouettes in the center of the Roman Coliseum. It wasn’t the first time I was there, however, it was the first time I was on a trip where I felt absolutely insignificant. I marveled at the history of this place, the people that lived, worked, taught, learned, created, and died here throughout the ages. John (white t-shirt) and his brother visiting their Grandfather’s library in Italy. My mind was bombarded by the historical possibilities, the realities of lives lived, and lives lost in this time-weathered place. What stories are known? Which are unknown? What key learning has been brought forward through time? Have we missed more than what we know? And what will we never know? Forever lost to history. The rush of information which permeated my senses as I stood in this place trying to recall what I knew about Ancient Rome was overwhelming. What experiences, hardships, heartaches, successes, failures have this place seen? I shivered with delight and shuddered with insignificance of my own mortality. I thought, how could I live multiple lives in one lifetime? My father was an intellect. He was very cerebral – logical and precise, I guess as a chemist, you need to be. He thought deeply about many things and one example he had hanging in his study which now hangs in mine, its origin is unknown to me. The feelings and the questions inspired by this old book so many years ago where similar to the feelings and thoughts I had standing in the Roman Coliseum. This book inspired me to love books as did standing in the center of the coliseum in Rome inspired me to love a life of life-long learning. This was the impetus that led me to Dalhousie’s MBA(FS) program. A thirst for knowledge and experiences. Having completed my MBA(FS) in 2015, and with some serious time on my hands, I have started to collect books, all kinds of books. I tend to shy away from digital books because there is no better feeling then immersing oneself in a book, flipping the pages, using a bookmark, and reading it cover-to-cover. John A. Luchetti MBA(FS) 2015 is PMO Lead at TransUnion, specializing in project/program/portfolio management. His areas of expertise cover a broad spectrum from relationship management and cross functional team management, to negotiation, conflict resolution, and mediation. John has graciously agreed to be a repeat contributor on CFAME Connection.